This book is one of the outcomes of a series of three meetings on mathematical cultures, principally funded by the UK Arts and Humanities Research Council (AHRC), as a network under its Science in Culture theme. There is a description of the network on its website and also in the Journal of Humanistic Mathematics (2012) 2 (2): 157-160. Create an interdisciplinary, international network of researchers with interests in mathematics as and in culture, with a supporting internet node that will outlive this funded project. Facilitate discussion of the methodological challenges facing the study of mathematics as culture. Mathematics is simultaneously culture and knowledge. Scholars who treat it as culture must respect its status as knowledge; those who engage with it as knowledge must acknowledge that it is a collection of human practices. This project hosted three conferences. The first (September 2012) had the aim of exploring and beginning to map the variety of and connections among contemporary mathematical cultures. The second (September 2013) aimed to articulate and classify mathematical values. The third (Easter 2014) discussed mathematics in public culture. How well did it succeed in these six objectives? Taking them in order: participants did engage across disciplinary boundaries and some conversations and collaborations have developed among scholars who did not know each other before this project. On the other hand, the ‘supporting internet node’ turned out to be more of a repository than a hub of activity—the participants in this project revealed themselves to be largely indifferent to social media and few took up opportunities to blog or tweet. There were some notable exceptions following the third and final meeting. As a repository, it is a success. Programmes, participation lists, abstracts of all the contributions and videos of many of the talks are available on the project site. On the second objective, we did discuss methodology, but this was less salient at the meetings than we originally hoped. Perhaps this was because the central term, ‘culture’, was not sufficiently well articulated to stimulate debate. From the presentations in this series, it is clear that the concept of culture remains relatively untheorised among writers on mathematical practice. Only a few of the philosophers and historians at the meetings deployed a notion of culture explicitly, and these were mostly lacking in conceptual articulation. 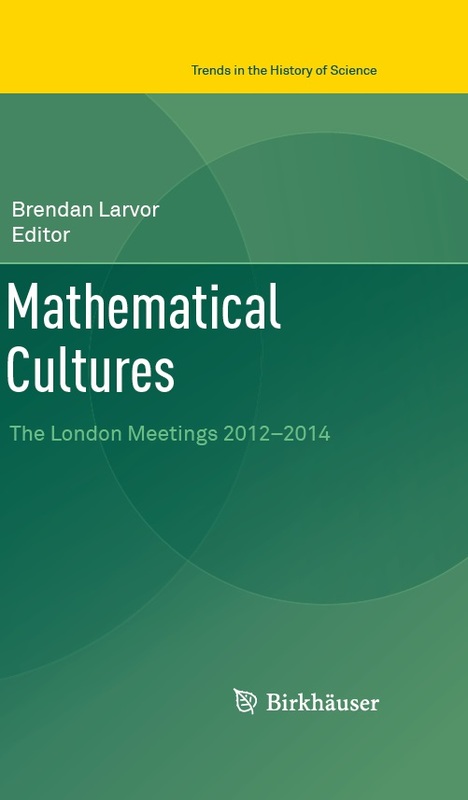 There were some exceptions who honoured the project theme and made a deliberate effort to theorise mathematical cultures as such (see especially Sørensen’s paper in this volume). Regarding the third aim, the presentations explored a satisfying variety of mathematical cultures, including research communities and a valuable discussion of the cultural significance of mathematics in the world of finance. Since many of the contributors are historians, we have to take a generous reading of ‘contemporary’ to include most of the twentieth century, but given that it is common to regard mathematics as having assumed its current form in the inter-war years, this is not unreasonable. The chief disappointment is that we did not have a presentation that vividly articulated the perspectives of reluctant mathematics pupils. Our project would have benefitted from an exploration of the possibility that some of the reluctance of reluctant learners is cultural—that mathematics has cultural associations that some children find off-putting. We did hear some contributions in this direction from teachers (see Snezana Lawrence’s chapter in this volume). We also had a report on the reception of European mathematics among the indigenous people of Western Canada, and on efforts to overcome the resistance to European mathematics resulting from its associations over decades with education designed to eradicate indigenous cultures (see Archibald and Jungic in this volume). Perhaps more obviously ethnographic studies of this sort might supply a model for reading the cultural position of mathematics in other classrooms. We were more successful with respect to the fourth objective, in that we had several excellent papers on what it means for a proof to be beautiful—though the results were not encouraging for anyone seeking a rational, objective aesthetics of proof. The fifth objective, to articulate the cultural and educational value of mathematics, was (unsurprisingly in retrospect) problematic. Some contributors took mathematics to be a living embodiment of values normally associated with the European Enlightenment philosophers of the eighteenth century: universality, objectivity, rationality. This stands in tension with the pluralist spirit of our enterprise: we took care to speak of mathematical cultures, in plural. If mathematical cultures really are distinct and have important differences, then one cannot assume quite so easily that they are all equally valuable and virtuous—or valuable and virtuous in the same ways. Nevertheless, there is still a worthwhile job to do in articulating the value that some mathematics has had for some people at some times and places—this may still provide educators with better motivational resources than vague promises of improved career prospects. The principal realisation of objective six is this book. All of the contributions have been through a process of review by anonymous referees. I am immensely grateful to these referees, who gave their time and expertise pro bono, and who also helped with the selection of talks for the conferences. I must also record our gratitude to the London Mathematics Society and the staff at De Morgan House for their help with and support for this project.